As a way to thank you all for your company over here on Bright.Bazaar this year I've teamed up with some of my lovely sponsors to arrange a few festive treats in the form of eight giveaways! As well as that, I've arranged eight generous discount codes/free gifts that you can take advantage of when you shop their stores. From interior accessories to paper goods you will be sure to find the perfect Christmas gift or even a little treat for yourself! Thank you to all the sponsors for their generosity. Visit any of the sponsor shops from the links below, pick a product you like and then leave a comment below saying why you like it. For five extra entries, post a blog about any of the sponsors and this giveaway on your own blog then leave a further five comments below. Small print: Giveaway closes at midnight GMT on 9 Dec 2011. Winning commenters will be chosen via eight random.org number searches and they will each win the product that corresponds to the same number as their search (i.e. 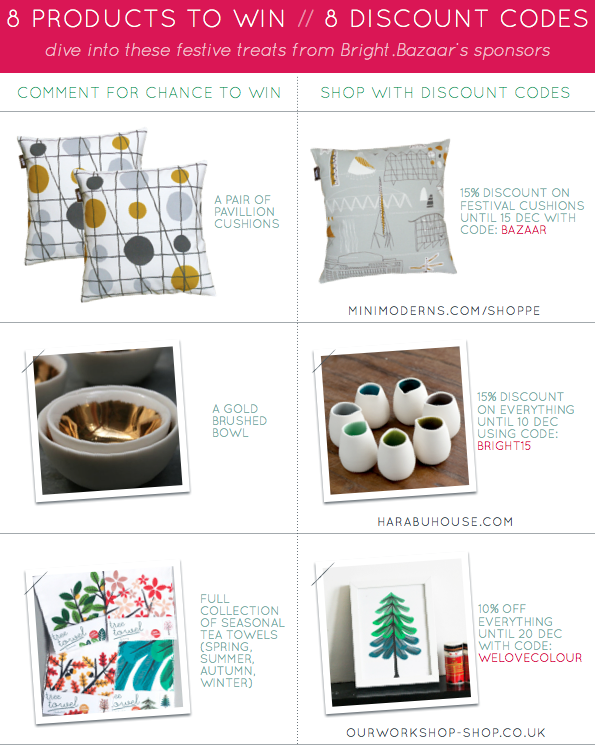 if your comment number comes up on the first random.org search then you would win the Mini Moderns cushions, on the second search you would win the gold brushed bowl and so on). As the Starfish Bay throw is UK only, I will continue to search comment numbers on the sixth random.org search until a UK-based commenter's number is selected. (If you don't have a blog, please leave contact details and state whether you are UK based or not in your comment.) Prizes are non-transferable and all decisions made by random.org are final. 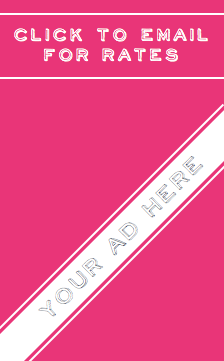 Sponsors have the right to withdraw their discount codes at anytime without notice. Good luck! Oh my goodness, what an awesome giveaway! Those Kantha Throws from Harabu House are stunning! I'm a sucker for quilts, you can never have too many quilts, especially ones with such gorgeous colors. This is incredible!! I visited all the stores, which are great, but was particularly partial to Our Workshop and their adorable Penguin Nesting Dolls. What a clever and sweetie holiday decor item -- and besides, my husband LOVES penguins! wow!! now that is some giveaway...love the gold-brushed bowls from harabou house! i love love love the moorly wool blanket from rowen & wren. it looks very cozy and a perfect accessory for winter. Wow! What an amazing giveaway!! I'm really drawn to Rowen and Wren's Freya Herringbone Throw! I'm a sucker for stripes and heringbone! I also love the neutral colors. I love those seasonal tea towels! I love how cute and colorful the prints are! They'd match just about anything and I can enjoy them while I cook! Fabulous giveaways! I love the Animal Print Cotton Square Cushion because they are so colorful and whimsical! Wow! This is great, and it's so hard to comment on just one shop. I do love those towels from Our Workshop. How fun to stretch them over a frame, hang them and switch them out for each season. 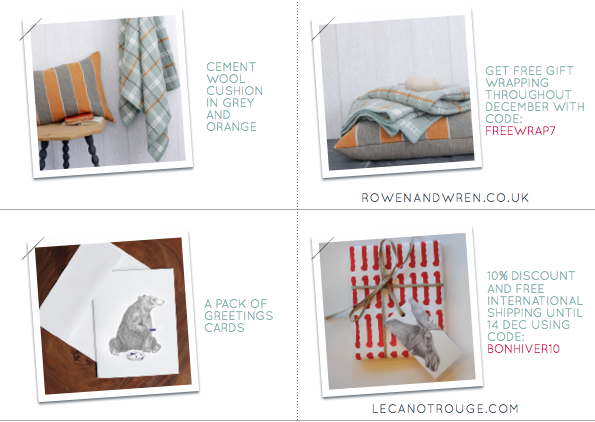 I love the Hidden Hare cushion from Rowen and Wren- it's fantastic! Amazing amazing giveaway, Will! So many fabulous stores with so many fabulous products! I love the lace placements from Harabu House - such a gorgeous grey! Free shipping to the UK fab! This is such a good giveaway! How very exciting!! Love the gold bowls and those christmas cards but also love the throw too! Sweet!! That Rectangular Tray is amazing! I think trays are the perfect organizer! FIKA CUPS from Harabu House is so cute. Perfect for me and my daughter! a giveaway as good as christmas :-) all of the stores and gifts are lovely! i have to wish a happy 6 month birthday though to rowen & wren! we have one their stola mixed bulb pendant in our home, but i'd love to have their kasa lanterns too. heeheehee. I absolutely love the gold brushed bowl from Harabu House and the beautiful trays from Marika Meijers. Both would serve as functional and eye-catching ways to organize jewelry. After visiting all the sites, I fell in love with the Halse Adjustable Floor Lamp from Rowen & Wren. Love the contrast of ivory shade against the chrome body. The simple, clean lines make it perfect for any room! All the prizes are gorgeous! So hard to actually choose as there are a few designers I haven't come across. However I would love the set of 4 tea towels by ourworkshop. I adore those trees, especially the oak tree. Anything with these prints on are just great and I have a real thing about acorns at the moment! I love those seasonal tea towels! I already have a collection of different ones I hang as art (in a rotation). These would be perfect additions! 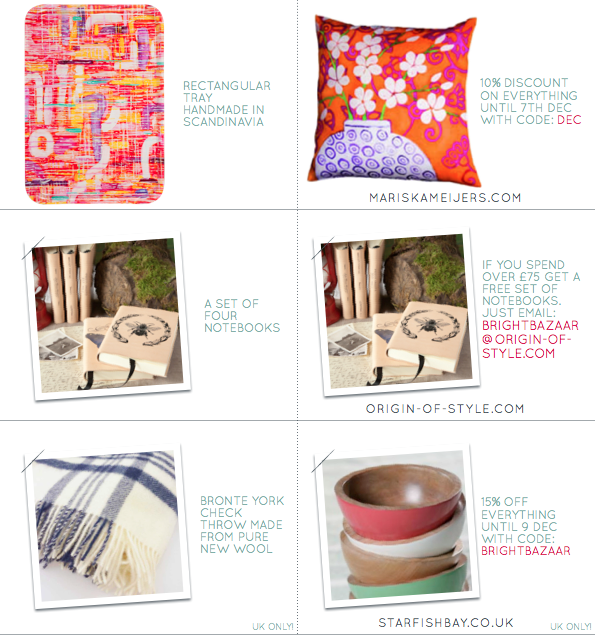 I love everything on the Harabu House website, especially the vintage Kantha throws. Thanks for the chance to win one of your picks! The Irish Linen Bedding from Natural History intrigues me. I've long been curious about linen sheets and someday hope to find some great ones. Gosh, I adore the seasonal towels and that tray! How fun! I've visited all of the shops and what an amazing giveaway! I'm really partial to the tea towels from ourworkshop. Thank you for intoducing me to the amazing shops! I especially love Harabu House; the lattice coasters are so nice! I absolutely love the knitted footstools from Starfish Bay, also the Bronte throws, I am obsessed with anything knotted or woolly at them moment! The first store I checked was le canot rouge because their name and code bonhiver sounded so French Canadian, their card themes looked so Canadian. So soft spot for this one because it's so close to home and I discovered I could get their cards close to home too :) Two of my favourite things are from Rowen & Wren: moorly wood blanket and clement wool cushion. They seem so cozy and match some of the colour scheme I'm planning for my soon-to-be new house. Love the sweet tea towels! What great products that shop has - the Yes tote bag was great! I love Rowen & Wren's Freya herringbone throw! Awesome giveawy!!! I LOVE Harabu House - it's hard to choose one item. I love the Scandinavian Isak lidded cups ... great to keep my tea warm! Form follows function, indeed! The sake set at Harabu House is perfect. Since my return from Japan I've wanted to have a unique way of presenting sake to my guests and this is it! Brilliant Pillows and Brushed Bowl! I love the recycled brass T'boli bells over at Harabu house. Subtle yet beautiful! I'm loving the Mini Moderns festival porcelain espresso set! It definitely fits in with my penchant for all things grey and yellow at the moment. So pretty! 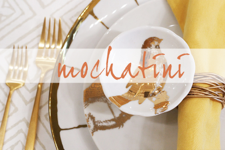 I love the gold brushed bowls from Harabu House! I have recently started decorating with more gold accents because I love the brightness it brings to a space. Great giveaway...would love to win any of these great prizes! Lovely giveaway! My absolutely favorite are the gold brushed bowls from Harabu House. Divine! Now that's a giveaway, Will! Fantastic shops! I especially love Mini Moderns and am obsessed with their Whitby wallpaper and think the Whitby tea plates would look great on my table :) Or the Knock Knock rug would be the finishing touch for my son's bedroom...too many great finds to pick just one! Loved seeing your top picks over at West Elm today too....Happy Sunday! Wow! Thanks for the great discounts on some fantastic items! What a great blog and giveaway! I clicked through a few of those shops and a cuople of my favorites are the Sitting Comfortably? Canvas Bag from Mini Moderns and any of the blankets on Harabu House. Beautiful stuff! Many pretty things here! WIsh i lived in the UK and could win that throw blanket... But the gold bowls from harabou house would be perfect for the holidays as well. love their shop! What a lovely giveaway! I vote for the gold brushed bowl to make our Christmas more solemn. It's simple but elegant. Thank you! Those gold-brushed bowls are gorgeous! Thanks for this lovely giveaway (and for making most of it open to international readers. I'm in India). I love Our Workshop's French-theme teatowels - especially Bon Bon - for the simple & bold designs. Wow some great shops here and what a fantastic giveaway! It's really tough to pick a favourite, but I think it's mini moderns for me and the festival range especially the rugs and the espresso cups they are delightful! Gosh hope I'm lucky. I have emailed you all with the email you need to send your addresses to for prizes to be sent out. Thanks for reading the blog, folks!